In its headlong rush to transition to an ultra-low-cost carrier (think Spirit), Frontier is leaving nothing off the table. Which is leaving less on the table for the airline’s customers. Earlier this month, Frontier implemented a suite of Spirit-like policy changes, including fees for carry-on bags and for non-alcoholic beverages ($1.99 for coffee or a soft drink), and fewer frequent-flyer miles for tickets not purchased directly from the airline itself. We are writing to let you know of a change to your Summit benefits. Unfortunately, we will no longer be able to provide complimentary in-flight TV effective Aug. 1, 2013. Because of this change and to uphold our commitment to you, we’ll be offering you the choice of a complimentary onboard snack box or snack to replace this benefit. Please show your boarding pass or membership card to the flight attendant to receive your complimentary snack. To view all your elite benefits, visit FlyFrontier.com. Thank you again for being a loyal Summit member on Frontier Airlines. Frontier charges $3.99 for DirectTV on flights of two hours or less, $7.99 for flights 3.5 hours or more. It isn’t as though Frontier has an extra-generous elite program, bulging with perks. On the contrary. 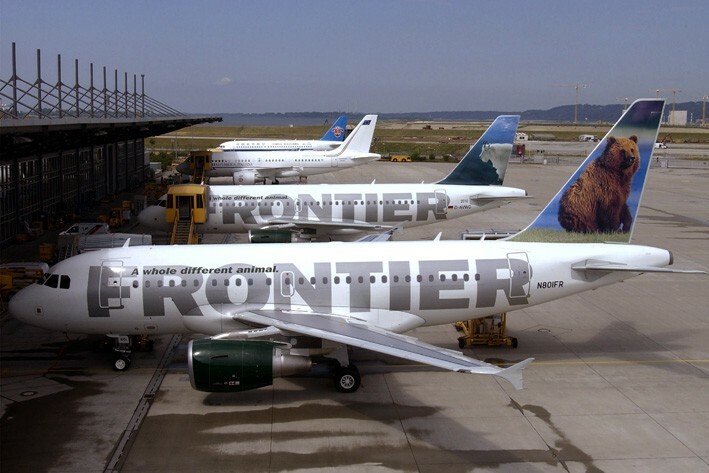 The ultra-low-cost model may ultimately be a financial win for Frontier. It’s less likely to be a win for elite flyers. It remains to be seen what will be left of Frontier’s elite program after the transition. But if the current trend continues, Frontier’s most frequent flyers will find themselves with little incentive to maintain their loyalty to the airline.